Buy the Farm . . . Share: A New Car! This morning was kind of a crappy morning. It started with me buying a new car. I hate buying a new car. 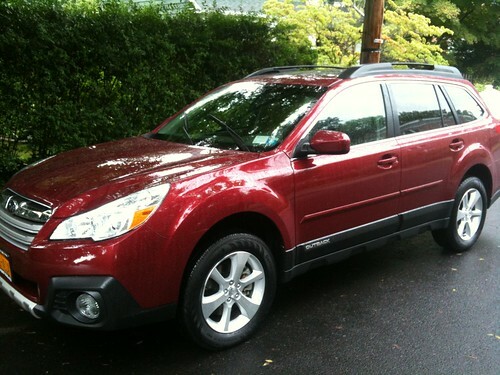 It's extra annoying because it's the fourth new car we've bought in the past two years. The Wombats, in an inadvertent effort to make us spend all of our money on them, have necessitated the purchase of an additional car since their car seats only barely fit in our other car and that leaves no room for the assorted paraphernalia that comes with a pair of babies. After picking up the car, in the pouring rain, I did not have enough time to set up the car seats so we needed to take the old car to the second consecutive daily doctor's appointment. This was Jen's (and the babies') postpartum check up. The guys were particularly annoyed by this because I'm pretty sure they were thinking, "Didn't we just do this yesterday? What is the point of weighing us again. Don't you know we hate it?" I've found that most of parenthood, so far, is doing what you think is right for your babies even though they hate every minute of it. The sad part is that they won't even remember any of this? What's the point of torturing your children if they won't even remember any of it? After a traumatic (more so for us than them) mid-afternoon feeding where we managed to get them back on the schedule and asleep. This left me to make dinner. 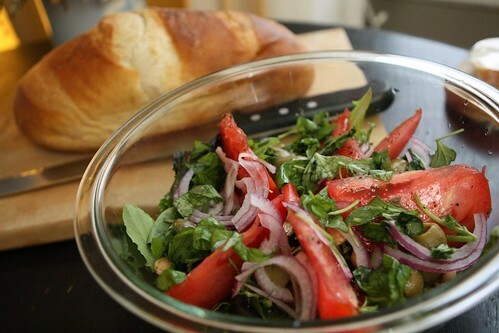 I used up some of the New Jersey beefsteak tomatoes with olives, red onion, lemon, olive oil, greens, and Marcona almonds. Then I browned some beef in a pan, tossed in a jar of prepared tomato sauce (Rao's), and some ricotta cheese. 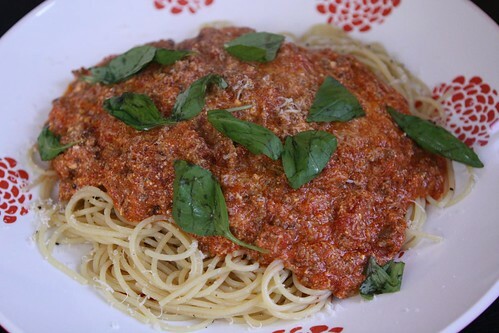 I added some cooked spaghetti and topped it with fresh basil and grated Parmigiano-Reggiano. It's one of the laziest dinners I am capable of conjuring up. Luckily it is filling and delicious. 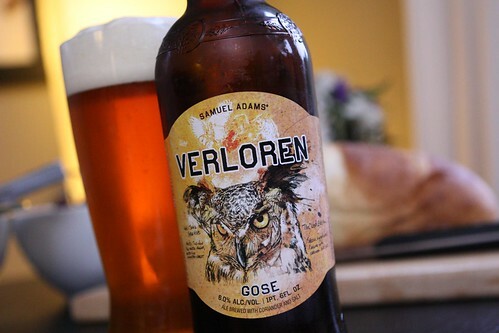 For drink I poured this Verloren from Samuel Adams. It is a version of a German style of beer called Gose which is brewed with coriander and salt. The salt definitely gave it an interesting flavor. This is probably not the number one accompaniment to a spaghetti dinner but I enjoyed it nonetheless. After dinner we should have gone directly to sleep. After all, they always tell you to sleep when the baby sleeps. However, it is demoralizing to not get a second's rest and just go directly to sleep. Instead we drank tea, watched Sherlock and ate shortbread cookies. Fun now. We'll pay for it later.